The Fred & Pamela Buffett Cancer Center groundbreaking ceremony will begin at 10:30 a.m. today. Leaders of UNMC, The Nebraska Medical Center and the University of Nebraska Foundation invite all employees, faculty and students to a celebration of the new Fred & Pamela Buffett Cancer Center today. The groundbreaking ceremony will begin at 10:30 a.m. at Emile Street and Durham Research Plaza. The cancer center project represents one of the largest construction jobs ever in Nebraska. 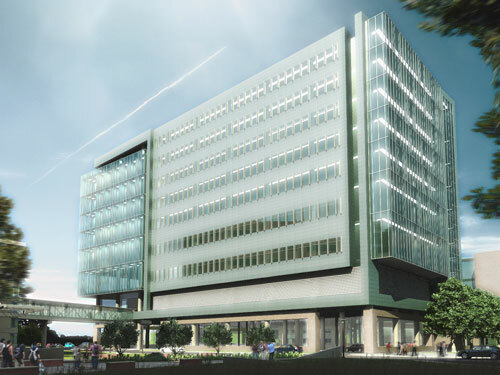 The $323 million cancer center project includes a multidisciplinary outpatient clinic, a 98-lab research tower and a hospital tower with 108 beds dedicated to oncology patients. The Fred & Pamela Buffett Cancer Center, which will be built on the present location of Swanson Hall, is expected to be completed in 2016.